You’ve got access to all your mags, IFAK, and whatever else you’ve packed in there. A good chest rig will take you about a second to throw on. With the right rig, you’re always ready to react and respond at a moment’s notice… to any kind of situation. Chest rigs are essential for tactical preparedness. Choosing your first rig is HARD. It’s easy to get overwhelmed. You need to sort through different costs, colors, looks, models, functionality, etc… enough to make your head spin. Is Condor Really Airsoft Cr*p? What Are The Best Chest Rigs On The Market? Side note: This article is for beginners. If you’re about to buy your first chest rig then you’re in the right place. But… if you’re looking for something more advanced then check out Garand Thumb’s video on Chest Rigs (link below). Let’s start with a very basic thing – the color your rig. It matters because of visibility. Sticking out from the crowd and blending in with your surroundings. I like to keep a low profile whenever possible. 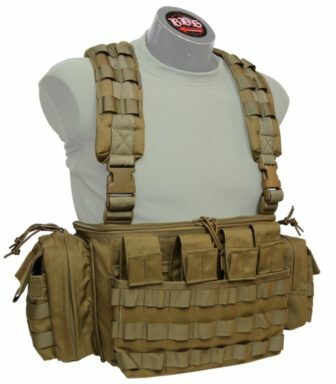 For that reason, I prefer coyote brown and olive drab as my chest rig colors. I’ve found these two to work in most situations. By most situations I mean – forest, fields, shooting range. For those places, I don’t recommend going with black, as it sticks out too much. Same with Multicam. Of course, in the end, everything depends on the environment that you’ll be using the rig in. Use common sense and choose accordingly. For your first rig, you’re much better off sticking to a model that has a couple of pockets already present (usually 3 mag pouches in the front). MOLLE rigs require some experience. You’ll need to know WHAT pouches you’ll need WHY. And that’s an extra headache that you don’t want to have as a beginner. 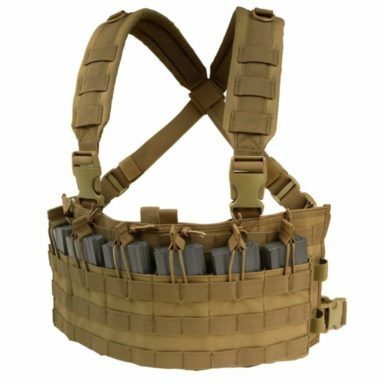 The only thing that full MOLLE rigs have going for them is full customizability. If you want that, and don’t mind paying a little extra for the pouches, go for them. Especially if you already have MOLLE pouches lying around somewhere. And it’s not like you’re losing out on anything with pocket rigs. 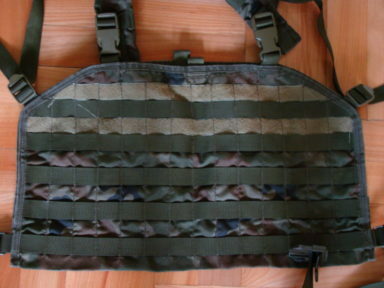 In most cases, rigs with pockets will have some MOLLE webbing on straps/back. This allows you to customize your rig to an extent. 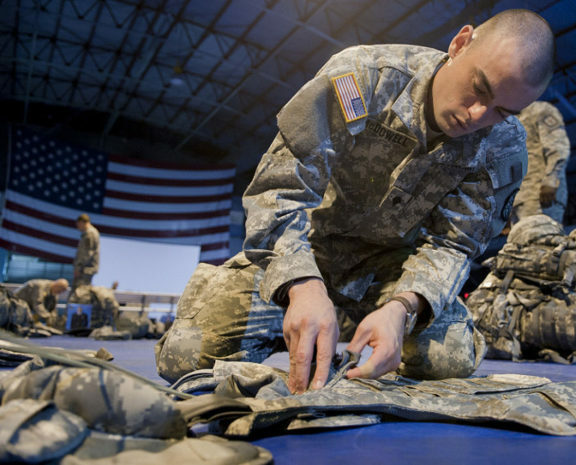 You get the pre-made pockets – PLUS the chance to attach additional MOLLE pouches if you want to do so. This makes pocket rigs a win/win. At the end of the day – they both work. Most rigs fit most people, so I wouldn’t worry about this too much. X-harness will fit better on small people, but ride a bit more when you run. H-harness has better weight distribution, but might be too big if you’re on the smaller side. Chest rigs come with weapon-specific pouches. Most will fit 5.56 and handgun magazines. BUT if you have an AK (7.64 magazines), rigs that are made for 5.56mm magazines will be too small for you. You’ll need a specific AK rig. 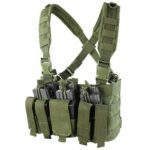 I’ve taken this into account – you’ll find best chest rigs for AK and AR magazines in the reviews below. 1. Carrying capacity – Chest rigs are meant to be light. They’re not made to carry lots of gear. Carrying capacity should be the last thing on your list. 2. Comfort – Most chest rigs are adjustable. It’ll probably fit you fine. Plus, there’s no way of knowing how a particular rig will behave in action on your body. So I wouldn’t worry about comfort too much. 3. The Perfect Loadout – Start small. 3 mag pockets are all you need to get started. Then add gear according to what you need. Don’t overthink this. Condor’s chest rigs are the most popular on the market. Admittedly – they are an airsoft brand first and foremost. Still, Condor makes some of the best rigs available for the money. Don’t buy any of that. Condor’s rigs have been tried and tested by thousands of people over the years. I’ve used multiple Condor rigs in the past. And I’ve had nothing but good experiences with the brand. 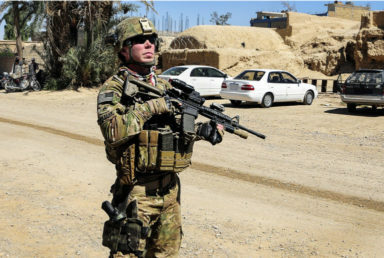 Sure – you won’t take your Condor rig to Afghanistan. They’re not made for that. But as a starter rig – just to get a feel and see if chest rigs are for you – Condor offers fantastic value. Great quality for the price. I mean – why would you drop $100 on your first rig if you can get a decent one for $30? Especially when you don’t know if chest rigs are for you yet? Keep in mind that the people criticizing Condors are spending in the ballpark of $100-$200 on their rigs. That’s too much for most people out there. Condor is not “airsoft cr*p”. Condor rigs are perfectly fine, especially when you consider the price. They get the job done. And that’s all you need to get started. I can’t think of a better first rig to get started than Condor MCR6 (or MCR5 below). It’s a basic rig that will be good for everyone. It’s proven in action and holds up well. I’ve used this chest rig before and have ZERO complaints with it. It’s a cheap way to start experimenting. Play around with Condor – and you’ll have an idea about what you’ll want to spend your big bucks on long term. What makes this rig special is its magazine layout. You’re getting 6 mag pouches that are spread out. I find the layout intuitive and easy to get used to (as opposed to stacked mag pouches). The rig is built well – especially considering that it retails at below $50. The stitching is good and lasts. 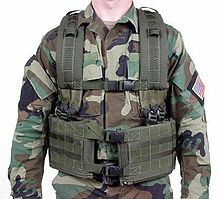 You’ve got MOLLE webbing on the sides and in the front for any extra gear you might need. There is one common complaint with Condor: Plastic Parts. They are cheap and might break over time. They’re not hard to replace, though. The rig is adjustable and will fit most people. I have no complaints about the fit – everything’s comfortable and works fine. (I’m 6 foot 3 with a real small belly, for reference). With that being said – if you’re on the small side (around 30 inches in waist), you’ll need to pull the straps together real tight. That is about the smallest size that this rig can fit. Other than that, front buckles can get in the way sometimes. But you get used to it. Oh, and note that the rig will be tight and rigid when it first arrives. It took me about 2 days to wear mine in. MCR6 Chest Rig is my favorite rig from Condor. It’s inexpensive and gives you the most bang for the buck. Couldn’t think of a better one to start from. You’ll notice small flaws here and there. But at the end of the day, this rig holds your gear and stands up to abuse. It’s Condor’s most popular model for a reason. Condor MCR5 is a great starter rig, just like the MCR6 above. The only difference is that MCR5 has stacked mags, while MCR6 has spread out mags. Which one is better? Down to personal preference. But MCR5 keeps the mags together – the weight is concentrated at the front of the rig. This makes Condor MCR5 a bit worse in terms of weight distribution than the MCR6 above. But you also get better mobility (with no mags on the sides). You’ve got MOLLE webbing on the sides of the rig for any extra gear you might need. As usual with Condor you get good double stitching and nylon fabric. But the cheaper plastic parts can wear down with time. Easy to put on and take off. The fit is adjustable, but keep in mind that you’ll have to tighten it to the max if your waist is ~30 inches. As I said above, weight distribution is not the best. The rig will sag a little when fully loaded. Condor MCR5 is a great, great rig. Especially for the price. I like the MCR6 above slightly more than this one… but at the end of the day they’re equal in terms of what you’re getting. People report occasional QC problems and you might as well. The good thing is that all rigs come with a warranty – double check that yours is fine after you get it. 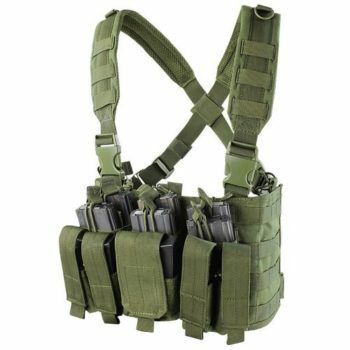 If you have an AK – Rapdom Tactical Chest Rig is the one for you. First off – Rapdom’s build quality is about the same as Condor. The only exception is that there is no hydration bladder pocket on this one. Overall everything holds together well. Strong stitching and good nylon. Still… the rig is made in China. The plastic bits are cheap and might need to be replaced eventually. But Rapdom’s quality control seems to be good – couldn’t find any complaints online. The rig is adjustable, but runs a little big. The sizing should be about the same as Condor’s, as they also fit better on larger people. With that being said, I couldn’t find a single person complaining about the fit on this rig. Rapdom offers great value for money. If you’ve got an AK – this is the rig that I recommend. Otherwise, I would go for Condor as their reputation is a little bit better. 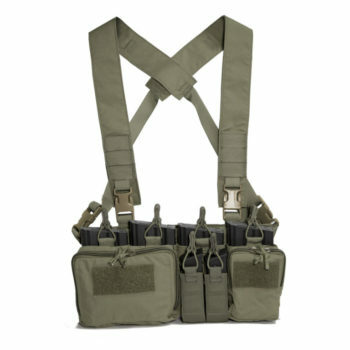 Condor MCR7 Ronin is the budget MOLLE rig on the list. This time without pockets and pouches. This rig is fully modular. Meaning that you’ll have to buy and attach your own MOLLE pouches to it. Great, sturdy construction. Standard Condor quality – no complaints. But because of the H-harness, the MCR7 is actually stronger than the other Condor rigs above. You can also see it when you compare the pictures. This is one of the most comfortable chest rigs that you can get. You get a better weight distribution. Comfortable to wear and move in – and it can take more weight than X-harness. With that being said, this rig is also heavier than the ones X-harness above. Due to all that extra material. And that weight can add up fast with those additional pouches. Go with Condor MCR7 if you want a chest rig you can play around with and tweak. The quality is great, but again, you might get an occasional rotten apple from the Chinese factory. 5.11 Tactec Rig will get you You get the same features as Condor, but a better construction quality. The stitching is noticeably better, as well as the material. The front pouches are covered – an unusual design choice for these rigs. The 5.11 Tactec comes with an adjustable H-harness. The fit is comfortable. This build is the best you can get for weight distribution and comfort. The material on this one (Cordura 500) is light, not stiff at all. It fits your form while you’re moving. All in all, a very comfortable rig. 5.11 Tactec is in a different price class than Condors. I have no doubt that this rig is also made in China. But the quality is noticeably better. So, If you want a slightly better rig for your money, this one’s a good pick. Less risk of bad batch coming through from China as well. 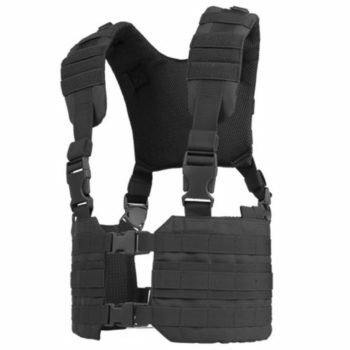 If you want to step up your chest rig game, take a look at BDS tactical. They’re professional rigs that are 100% made in the USA. 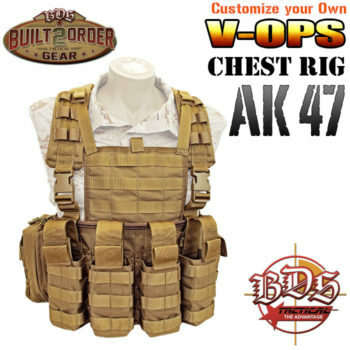 BDS Tactical MVO (Mobile Vehicle Operator) is the rig specifically made for AR magazines. These rigs are incredibly strong. I’m talking “take it out on deployment” kind of strong. These rigs have everything that you could possibly want from it. They retail for around $100 at the time of writing this article. 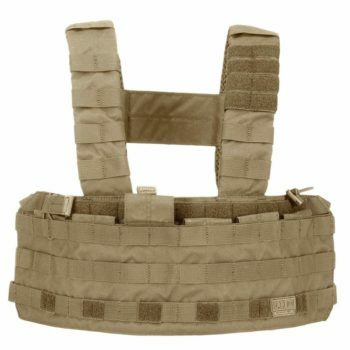 This price is incredible for a professional, U.S. made and tested chest rig. Check the video below for a full review. I highly recommend these if you can make the room for these in your budget. Same as the other BDS tactical rig above, except this one’s made for AK-47 mags. Same company, same quality, made in the U.S.
Haley makes the best rigs on the market. That company is a legend. 1 “Stuff It” pouch (for your IFAK). They cost about the double of a BDS… and about as much as five Condors. Haley is serious stuff. This is equipment used by soldiers on deployment. You shouldn’t start with Haley. It’s an overkill for a beginner. But if you want to have one of the absolute best chest rigs out there… and don’t mind blowing $200 on it… Haley is all yours. It does not get better than Haley… but the BDS above gets pretty close. Mission should dictate gear selection. Are you going to shoot in the range, or bugging out? When it comes to gear, generally less is more and not all of your pouches have to be full all the time. Really think about what you need – and pack only the essentials. This is especially true for prepping and bugging out. Extra weight adds up fast on your chest rig, big time. Curious about the chest rigs that big boys use? What the absolute best chest rigs out there are? 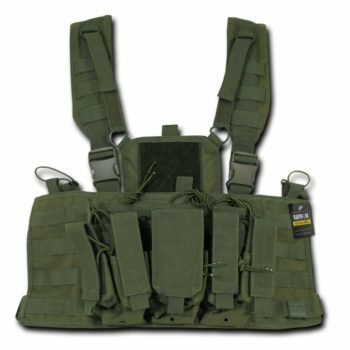 I hope that this article helped you find the right chest rig for you. But who are we kidding? You’ll probably end up going with Condor anyway. Condor’s got the market cornered down… and for $30 there’s really nothing to lose. If there is anything that anything should be added to this article – please let me know in the comments.